Esta es una excelente parodia de Saturday Night Live sobre el miedo que la letrina del mass media llamada Fox News esta creando en los republicanos de los EE.UU. al informar sobre la caravana de migrantes que solicitaran asilo en dicho país. Para nadie es un secreto que Fox News es una cadena conservadora, Pro Trump y raramente es precisa cuando se trata de informar con la verdad. Fox News nunca hace fact-check de las afirmaciones del presidente de los Estados Unidos respecto a temas tan serios como economía, salud, inmigración, impuestos, relaciones internacionales, etc. En este video, el famoso “cold open” de SNL, se muestra como la periodista Laura Ingraham (perfectamente personificada por la comediante Kate McKinnon) crea miedo mostrando imágenes falsas y convenientes para Fox News al fiel estilo de los “alternative facts”. Tambien hay una entrevista al impresentable David Clarke, el controvertido y huachafo Sheriff de Milwaukee quien denosta el programa planned parenthood y también utiliza un discurso que alienta la suspensión del habeas corpus en los EE.UU. • Imágenes del Black Friday como si fueran los migrantes. Encontradas en “trutheagle.gun”. • “Hay musulmanes entre los migrantes”. • Imágenes de la película “World War Z” para mostrar la caravana. • Ingraham: “Habra cinco militares estadounidenses fuertemente armados por cada inmigrante descalzo en esta operación llamada ‘Eagle with a Huge Dong’ (‘Águila con un Tremendo Consolador’)”. – Clarke: “Impopular entre mi propia gente”. – Clarke: “La caravana es ta a solo 800 millas de la frontera y si estos immigrantes caminan a un paso normal de 300 millas al dia, ellos estaran aqui a tiempo para votar en las elecciones (mid term election). Justamente acá tengo unas imágenes aéreas de la caravana” (pero muestra imágenes de una migración de cangrejos). 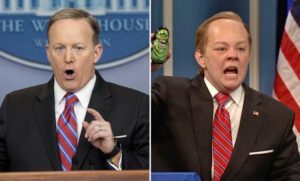 (CNN) – Thanks to “Saturday Night Live,’ we have two versions of Sean Spicer. There’s the sympathetic one who Melissa McCarthy plays hilariously on the late-night show. And then there’s the Spicer who has defended many of Donald Trump’s outrageous claims with false statements and outright lies. The problem is that the “SNL” version made Spicer far more endearing than he actually is. And this gives us a sense of the power of political comedy. Comedy can be used to make us laugh while reminding us of a politician’s transgressions. But the risk is that comedy can make a flawed political figure seem sympathetic and even help us overlook his misconduct. Just look at the reactions when Spicer announced his resignation as press secretary on Friday. Democratic Rep. Pramila Jaypal tweeted, “Huge blow for “SNL.” Farewell, Sean Spicer.” Journalist and CNN contributor April Ryan, who had battled with Spicer in the past tweeted, “It is over no more Melissa McCarthy!” While actor Zach Braff wrote on Twitter “actual footage of Sean Spicer” and shared a clip of McCarthy looking forlorn on the streets of New York. Don’t get me wrong — I had a similar reaction to the news of his resignation. But if McCarthy and “SNL” had not depicted Spicer in the fashion they had, do you think we would’ve seen such a strong reaction? Instead, many of us would have responded the way The New York Times “eulogized” Spicer on Saturday — as the person who began by lying on day one as the White House spokesperson and only continued from there. And we can’t forget Spicer defending Trump’s fact free claims of mass voter fraud by making up sources to help Trump cope with losing the popular vote. At the January 25 press conference, Spicer claimed that a 2008 Pew poll “showed 14% of people who voted were noncitizens.” However, the nonpartisan Politifact dubbed that statement false since the Pew poll “makes no mention of noncitizens voting or registering to vote. And the list goes on of Spicer’s outlandish statements in defense of Trump — from his remark that Adolf Hitler “didn’t even sink to using chemical weapons” in an effort to gin up support for Trump’s bombing of Syria to false statements about the role Paul Manafort played in the campaign in an effort to help distance Trump from his former campaign manager. “Spicey” then headed off to confront Trump, played by Alec Baldwin, demanding to know if Trump ever lied to him. Baldwin replied, “Only since you started working here.” Through comedy, “SNL” had erased Spicer’s moral culpability for lying to us by making it all Trump’s fault. In the time of Trump, comedy is playing a critical role in serving as both a cathartic release and source of empowerment for those who oppose Trump. But comedy shows must be aware that there’s a fine line between causing us to laugh at a political figure’s misconduct and minimizing them through comedy that makes him undeservedly likable. Dean Obeidallah, a former attorney, is the host of SiriusXM’s radio’s daily program “The Dean Obeidallah Show” and a columnist for The Daily Beast. Follow him @deanofcomedy. The opinions expressed in this commentary are his. For more on humor, watch CNN’s “The History of Comedy” Sundays at 10 p.m. ET/PT. Can SNL topple the Trump Administration? Si pudiste ver el Super Bowl el ultimo domingo, seguramente habras notado un comercial que ha tocado al tema de la inmigracion desde Mexico a los Estados Unidos producido por la empresa maderera “Lumber 84”, la cual, al finalizar, le pedia a los espectadores ir a su website para “completar el viaje”. El tema es que mucha gente penso para que ir al website para terminar un comercial? Transmitanlo completamente! No me hagan trabajar por una companhia de la que nunca he oido hablar! Lo que paso es que “Lumber 84” habia planeado transmitir todo el comercial pero la cadena televisiva Fox puso el grito en el cielo. El broadcaster considero el comercial como muy “controversial” como para ser transmitido durante el evento televisivo mas visto del pais y por ello “Lumber 84” fue forzado a cortar el comercial y remover parte de la cinta considerada ofensiva. El comercial es la historia simbolica de una madre y su pequenha hija ralizando un arduo y largo viaje a los Estados Unidos de Norteamerica. En el video que no se pudo ver en el Super Bowl, ellas llegan a la frontera solo para ser recibidas por una gran muralla de concreto. Pero ahi no acaba la cosa. Esta es un gran corto con un mensaje poderoso y claro: Las oportunidades estan siendo vapuleadas (algo contradictorio en el “pais de las oprtunidades”). Fox es una empresa con fines de lucro, por lo que tienen el derecho de elegir lo que hacen y no hacen con sus ondas, pero se ve ridículo que la misma red que no dice nada respecto de las gráficas torturas de “24” encuentren la imagen de una pared fronteriza demasiado “polémica”. La compañía subrayó que “sigue realizando, como previsto, sus vuelos regulares a Estados Unidos” y que “ninguno de sus tripulantes se ha visto, hasta ahora, afectado” por la nueva reglamentación. Dubái (AFP).- La compañía aérea Emirates de Dubái afirmó este lunes haber modificado las tripulaciones de sus vuelos con destino a Estados Unidos para adaptarse al decreto antiinmigración del presidente Donald Trump. “La reciente modificación de las condiciones de entrada en Estados Unidos para los ciudadanos de siete países se aplica a todos los viajeros y miembros de la tripulación” en los vuelos hacia aeropuertos estadounidenses, afirmó la aerolínea en un comunicado. “Hemos realizado los cambios necesarios en nuestras tripulaciones para adaptarnos a las (nuevas) exigencias” de la administración Trump, agregó Emirates, cuyos empleados son originarios de varios países, incluidos los afectados por el decreto de Trump. Trump firmó el viernes un decreto que prohíbe durante tres meses la entrada en Estados Unidos de ciudadanos de siete países de mayoría musulmana: Irak, Irán, Libia, Somalia, Sudán, Siria y Yemen. Se exceptúan las personas en poder de visas diplomáticas y oficiales y aquellas que trabajen para organismos internacionales. 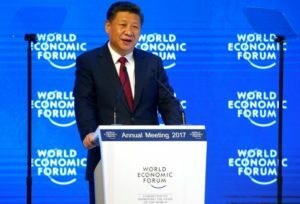 China is calmly mapping out global leadership aspirations from trade to climate change, drawing distinctions between President Xi Jinping’s steady hand and new U.S. President Donald Trump, whose first days have been marked by media feuds and protests. Just days ahead of Trump taking office, a self-assured Xi was in Switzerland as the keynote speaker at the World Economic Forum in Davos, offering a vigorous defense of globalization and signaling Beijing’s desire to play a bigger role on the world stage. Even on the thorny issue of the South China Sea, Beijing did not rise to the bait of White House remarks this week about “defending international territories” in the disputed waterway. Instead, China stressed its desire for peace and issued a restrained call for Washington to watch what it says. “You have your ‘America first’, we have our ‘community of common destiny for mankind’,” Retired Major-General Luo Yuan, a widely read Chinese military figure best known for his normally hawkish tone, wrote on his blog this week. “You have a ‘closed country’, we have ‘one belt, one road’,” he added, referring to China’s multi-billion dollar new Silk Road trade and investment program. And while China has repeatedly said it does not want the traditional U.S. role of world leadership, a senior Chinese diplomat accepted this week it could be forced upon China. “If anyone were to say China is playing a leadership role in the world I would say it’s not China rushing to the front but rather the front runners have stepped back leaving the place to China,” said Zhang Jun, director general of the Chinese Foreign Ministry’s international economics department. That message was reinforced this week when Trump formally withdrew the United States from the Trans-Pacific Partnership trade deal, distancing America from its Asian allies. 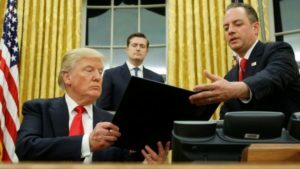 Several remaining TPP members said they would now look to include China in a revised pact, or pursue Beijing’s alternative free trade agreements. “At many important multilateral forums, China’s leader has put forward Chinese proposals, adding positive impetus to world development,” Su Xiaohui a senior researcher at the Foreign Ministry-backed China Institute of International Studies, wrote of the U.S. TPP decision in the overseas edition of the People’s Daily. “In the economic integration process of the Asia Pacific, compared to certain countries who constantly bear in mind their leadership role, what China pays even more attention to is ‘responsibility’ and ‘stepping up’,” Su said. China’s hosting of an international conference on its “One Belt, One Road” initiative in May is one opportunity for Beijing to showcase its leadership of global infrastructure and investment. A diplomatic source familiar with preparations said China was likely to hold it at the same glitzy convention center used to host the Asia Pacific Economic Cooperation summit in 2014, setting the stage for Xi’s most high profile diplomatic event of the year. “China’s pretty much inviting everyone,” the diplomat said. Another area where China is keen to be seen as leading the way is climate change. Trump has in the past dismissed climate change as a “hoax” and vowed during his presidential campaign to pull the United States out of the Paris Climate Agreement. Li Junhua, head of the Chinese Foreign Ministry’s Department of International Organizations and Conferences, said world was worried about climate change and whether countries would honor their Paris commitments. “As far as China is concerned, my president has made it extremely clear, crystal clear, China will do its part,” Li told reporters. It’s not always been this way. China has been through a long, tough learning process to become a more responsible power. In 2013, China, angered with Manila over the long dispute on the South China Sea, only stumped up meager aid to the Philippines after it was hit by Super Typhoon Haiyan, prompting rare dissent in the influential Chinese state-run tabloid the Global Times that Beijing’s international image would be hit. It also will not be plain sailing. On certain key core issues including the self-ruled island of Taiwan, China will not back down. In its first official reaction to Trump taking office, China’s Foreign Minister urged his administration to fully understand the importance of the “one China” principle, which Trump has called into doubt and under which Washington acknowledges China’s position of sovereignty over Taiwan. China also expects that under the Trump administration it will be left alone on one issue that has long dogged ties with Washington – human rights. The WeChat account of the overseas edition of the ruling Communist Party’s official People’s Daily noted with approval on Saturday that Trump’s inaugural speech neither mentioned the words “democracy” nor “human rights”. “Perhaps looking back, these things have been hyped up too much” by U.S. politicians, it added. Donald Trump señaló que los periodistas están entre las personas más “deshonestas del mundo”. 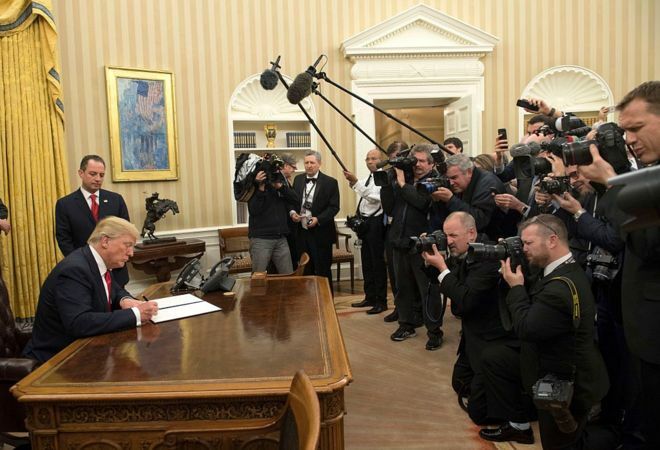 El primer fin de semana de Donald Trump como presidente de EE.UU. comenzó con una confrontación abierta con los medios de comunicación de su país. Funcionarios de su gobierno se enfrascaron en una guerra de palabras y cifras desde el sábado, cuando el propio Trump condenó la cobertura que los medios habían hecho de su toma de posesión el día anterior. Y la disputa fue por la cantidad de asistentes, a partir de la publicación de dos fotos que contrastaban la asistencia de público en la ceremonia del viernes y a la de Barack Obama en 2009. En las imágenes se evidenciaba que la asunción de Obama había convocado a mucha más gente a las calles de Washington DC que la de Trump. Después del contundente mensaje de Trump contra la cobertura mediática, el jefe de gabinete de la Casa Blanca (uno de los cargos más importantes del gobierno), Reince Priebus, dijo: “Frente a esa obsesión por deslegitimar a este presidente, no vamos a sentarnos y dejarlo pasar“. “Este gobierno va a luchar con dientes y uñas, todos los días, contra este intento de deslegitimar las elecciones “, le dijo Priebus a la cadena Fox el domingo. Luego vino el cruce de opiniones sobre cifras precisas de público, dado que no se difunde un numero oficial tras la ceremonia de toma de posesión. Durante una visita a la Agencia Central de Inteligencia (CIA, por sus siglas en inglés) el sábado, Trump dijo que “parecían como un millón y medio de personas” las que habían llegado al National Mall, pero dio evidencia alguna que respaldara su afirmación. Y calificó a los periodistas de algunas de “las personas más deshonestas del planeta” por publicar que habían sido muchas menos. Por su parte, el secretario de Prensa de la Casa Blanca, Sean Spicer, dijo que unas 720.000 personas se habían reunido el acto de asunción de Trump, pero también aclaró que “nadie” tenía los datos exactos de asistencia. Los medios de comunicación reaccionaron. The New York Times denunció que las reclamos de la Casa Blanca se basaban en “datos falsos” y agregó que eran “una llamativa exhibición de inventiva y agravios en el inicio de una presidencia”. Algunas cadenas estadounidenses como CNN y ABC consultaron registros históricos para refutar una a una las afirmaciones de Spicer. Pero tal vez la frase más controvertida en medio del debate entre Trump y los medios de comunicación de EE.UU. la dijo la consejera del gobierno Kellyanne Conway durante un programa de la cadenal NBC el domingo. “Si nos vamos a referir en esos términos a nuestro secretario de prensa, creo que vamos a tener que replantear nuestra posición en este programa”. Pero el presentador insistió en cuestionar a Spicer sobre los datos de la asistencia en la toma de posesión. La posesión de Donald Trump este viernes (izq.) y la de Barack Obama en 2009 (der.). Ambas imágenes fueron tomadas desde el obelisco que se conoce como el monumento a Washington. “Él lo que hizo fue presentar hechos alternativos. No hay manera de contar las personas dentro de una multitud con exactitud”, concluyó. La noción de “hechos alternativos” esbozada por Conway fue duramente cuestionada. “Los hechos alternativos no son hechos. Son falsedades“, le replicó Todd. A la vez, la asesora también citó otro hecho que generó fricción con los medios, cuando un reportero de la revista Time publicó de forma incorrecta que el busto del líder de los derechos civiles Martin Luther King había sido retirado de la Oficina Oval, donde funciona el despacho del presidente de EE.UU. El reportero ya pidió disculpas por el error. Conway le dijo a la cadena CBS que las 20 millones de personas que dependen de la cobertura médica conocida como “Obamacare” no se van a quedar sin atención durante la transición a un nuevo plan. Y agregó que Trump no va a entregar su declaración de impuestos. 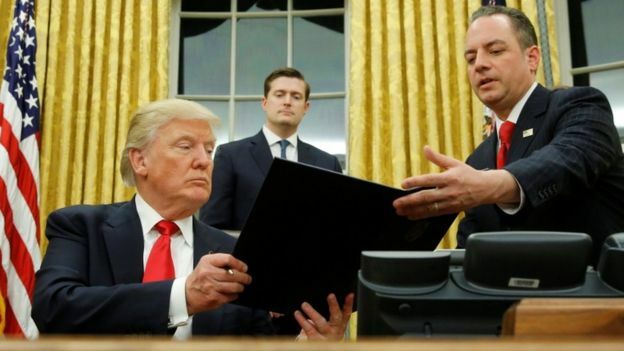 El jefe de gabinete, Reince Priebis, afirmó que la primera semana de Trump en el gobierno estará enfocada en temas de comercio, inmigración y seguridad nacional. El jefe de prensa, Sean Spicer, dijo que el presidente Trump se iba a reunir con su par de México, Enrique Peña Nieto, el 31 de enero y con la primera ministra británica, Theresa May, este jueves. Varios medios de comunicación en Estados Unidos rechazaron la confrontación verbal con la Casa Blanca. The Washington Post señaló que las “falsedades mostradas por la Casa Blanca evidencian que la tradicional manera de cubrir noticias sobre el presidente ha muerto”. Y agregó que, de ahora en adelante, los medios deberían ponerle menos atención a comunicados oficiales y, en vez de eso, enfocarse en investigaciones de fondo sobre la administración Trump. La revista The Atlantic también mostró su preocupación por lo ocurrido y señaló en un editorial: “Si estás dispuesto a mentir sobre algo así de minúsculo, ¿por qué alguien debería creer lo que digas sobre algo grande e importante?”. kellyanne conway El jefe de personal de la Casa Blanca, Reince Priebus (der. ), dijo que las noticias sobre la asistencia a la posesión de Donald Trump era un intento de “deslegitimar este presidente”. Otro medio importante, Politico, llamó la atención sobre las graves consecuencias que tendría que el equipo de Trump continuara “teniendo una relación inestable y difícil con la verdad” y citando al senador demócrata Adam Schiff señalaron que eso “podría poner muchas vidas en riesgo”. “Este lenguaje combativo también se podría extender a temas importantes de gobierno y de seguridad nacional… lo que preocupa a muchos “, agregó el medio. La batalla con las cifras no se redujo a la cantidad de asistentes al National Mall el pasado viernes 20 de enero. 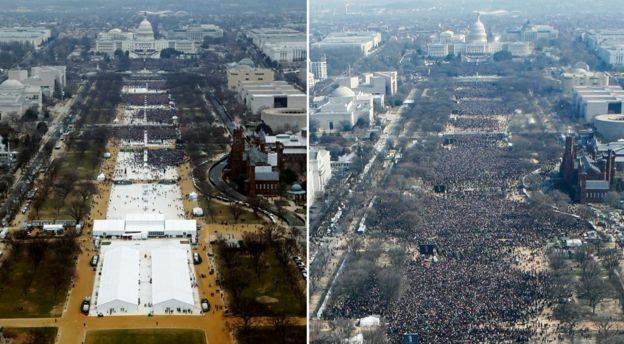 El domingo Trump escribió en una de sus cuentas de Twitter (@realDonaldTrump) que la audiencia en televisión de la ceremonia de posesión había sido de 31 millones de personas, casi 11 millones más que las que vieron el segundo juramento de Barack Obama en 2013. Sin embargo, esos datos – que fueron entregados por la firma Nielsen– son menores a los de 38 millones de personas que se pegaron al televisor para ver la asunción de Obama en 2009 y aún menos que los 42 millones que observaron la posesión de Ronald Reagan, en 1981. Estas cifras siembran más dudas sobre la frase del secretario de Prensa de la Casa Blanca, quien dijo que “había sido la posesión con mayor audiencia en la historia”. Pero más allá de la batalla con los medios, Trump hizo también referencia a las multitudinarias marchas por los derechos de las mujeres y en contra de su gobierno que se realizaron en más de 600 localidades del país al día siguiente de su asunción. “Estoy bajo la impresión de que acabamos de tener una elección, ¿por qué toda esta gente no votó?”, escribió en Twitter. Más tarde, sin embargo, escribió: “Las protestas pacíficas son un sello de calidad de nuestra democracia“. WASHINGTON — America, and the world, just found out what “America First” means. President Trump could have used his inaugural address to define one of the touchstone phrases of his campaign in the most inclusive way, arguing, as did many of his predecessors, that as the world’s greatest superpower rises, its partners will also prosper. Instead, he chose a dark, hard-line alternative, one that appeared to herald the end of a 70-year American experiment to shape a world that would be eager to follow its lead. In Mr. Trump’s vision, America’s new strategy is to win every transaction and confrontation. Gone are the days, he said, when America extended its defensive umbrella without compensation, or spent billions to try to lift the fortune of foreign nations, with no easy-to-measure strategic benefits for the United States. While all American presidents pledge to defend America’s interests first — that is the core of the presidential oath — presidents of both parties since the end of World War II have wrapped that effort in an expansion of the liberal democratic order. Until today, American policy has been a complete rejection of the America First rallying cry that the famed flier Charles Lindbergh championed when, in the late 1930s, he became one of the most prominent voices to keep the United States out of Europe’s wars, even if it meant abandoning the country’s closest allies. Mr. Trump has rejected comparisons with the earlier movement, with its taint of Nazism and anti-Semitism. After World War II, the United States buried the Lindbergh vision of America First. The United Nations was born in San Francisco and raised on the East River of Manhattan, an ambitious, if still unfulfilled, experiment in shaping a liberal order. Lifting the vanquished nations of World War II into democratic allies was the idea behind the Marshall Plan, the creation of the World Bank and institutions to spread American aid, technology and expertise around the world. And NATO was created to instill a commitment to common defense, though Mr. Trump has accurately observed that nearly seven decades later, many of its member nations do not pull their weight. Mr. Trump’s defiant address made abundantly clear that his threat to pull out of those institutions, if they continue to take advantage of the United States’ willingness to subsidize them, could soon be translated into policy. All those decades of generosity, he said, punching the air for emphasis, had turned America into a loser. To those who helped build that global order, Mr. Trump’s vow was at best shortsighted. “Truman and Acheson, and everyone who followed, based our policy on a ‘world-first,’ not an ‘America-first,’ basis,” said Richard N. Haass, whose new book, “A World in Disarray,” argues that a more granular, short-term view of American interests will ultimately fail. To Mr. Trump and his supporters, it is just that view that put America on the slippery slope to obsolescence. As a builder of buildings, Mr. Trump’s return on investment has been easily measurable. So it is unsurprising that he would grade America’s performance on a scorecard in which he totals up wins and losses. Curiously, among the skeptics are his own appointees. His nominee for defense secretary, Gen. James N. Mattis, strongly defended the importance of NATO during his confirmation hearing. Both Rex W. Tillerson, the nominee for secretary of state, and Nikki R. Haley, the choice for ambassador to the United Nations, offered up paeans to the need for robust American alliances, though Mr. Tillerson periodically tacked back to concepts echoing Mr. Trump’s. And there is a question about whether the exact meaning of America First will continue to evolve in Mr. Trump’s mind. He first talked about it in a March interview with The New York Times, when asked whether that phrase was a good summation of his foreign-policy views. He thought for a moment. Then he agreed with this reporter’s summation of Mr. Trump’s message that the world had been “freeloading off of us for many years” and that he fundamentally mistrusted many foreigners, both adversaries and some allies. “Correct,” he responded. Then he added, in his staccato style: “Not isolationist. I’m not isolationist, but I am ‘America First.’ So I like the expression.” He soon began using it at almost every rally. But Mr. Mead said that formulation disregarded the reality that “sometimes to achieve American interests, you have to work cooperatively with other countries.” And any such acknowledgment was missing from Mr. Trump’s speech on Friday. But the America that elected Mr. Trump had concluded that it was no longer willing to bear that burden — or even to make the spread of democracy the mission of the nation, as George W. Bush, who was sitting behind Mr. Trump, vowed 12 years ago. Mr. Trump views American democracy as a fine import for those who like it.